Beacon Rock State Park is a geologic preserve and public recreation area on Route 14 in the Columbia River Gorge National Scenic Area in Skamania County, Washington, United States. The park takes its name from Beacon Rock, an 848-foot (258 m) basalt volcanic plug on the north shore of the Columbia River 32 miles (51 km) east of Vancouver. 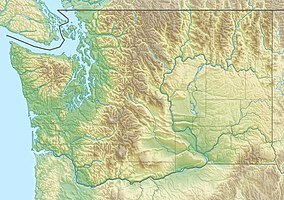 On October 31, 1805, the Lewis and Clark Expedition arrived here and first measured tides on the river, indicating that they were nearing the ocean. "Castle Rock" in a lithograph from Frances Fuller Victor's Eleven years in the Rocky Mountains and a life on the frontier (1877). Beacon Rock is an 848-foot-tall (258 m) monolith composed of basalt on the north bank of the Columbia River. It was named by Lewis and Clark in 1805; they originally referred to it as Beaten Rock, later as Beacon Rock. They noted that the rock marked the eastern extent of the tidal influence in the Columbia. The rock was later known as Castle Rock, until 1915 when its name was changed back to Beacon Rock. Henry J. Biddle purchased the rock in 1915 for $1 and during the next three years constructed a trail with 51 switchbacks, handrails and bridges. The three-quarter mile trail to the top, completed in April 1918, leads to views in all directions. The United States Army Corps of Engineers planned to destroy the rock to supply material for the jetty at the mouth of the Columbia (see Columbia River Bar), and dug three caves on the rock's south side. During this time, Biddle's family tried to make it a state park. At first Washington refused the gift, but changed its position when Oregon offered to accept. The park was established in 1935. Workers with the Civilian Conservation Corps made improvements which remain in use. Beacon Rock has been variously claimed to be the second largest free standing monolith in the northern hemisphere, or in the world, just behind the Rock of Gibraltar, Stone Mountain, or Mount Augustus, the latter two being very much larger than either of the first two. The assertion depends on how one defines the term "monolith." For example, Devils Tower National Monument in Wyoming is larger than Beacon Rock, but is considered an igneous intrusion rather than necessarily a "single rock." Beacon Rock is known for quality, challenging, technical rock climbing. The park's 4,464 acres (1,807 ha) include 9,500 feet (2,900 m) of Columbia River shoreline and forested uplands with 20 miles (32 km) of hiking, mountain biking, and equestrian trails. The park has boating and camping facilities.. Trails go to the top of Beacon Rock and Little Beacon Rock. Hardy Falls and Rodney Falls (Pool of the Winds) are scenic highlights along the trail to the summit of 2,445-foot (745 m) Hamilton Mountain, which has a view of Bonneville Dam and points east. Hamilton Mountain Saddle, located north of the summit, provides additional views, including Table Mountain, and the opportunity for a 7.75 miles (12.47 km) loop hike. ^ a b "Beacon Rock State Park". Geographic Names Information System. United States Geological Survey. ^ a b "Beacon Rock State Park". Washington State Parks and Recreation Commission. Retrieved February 14, 2016. ^ a b "Henry J. Biddle photographs, c.1860s-1925". Historic Photograph Collections. University of Oregon. Retrieved January 5, 2015. ^ GNIS says its decision to rename was in 1915: "GNIS entry detail for Beacon Rock". September 10, 1979. Retrieved September 9, 2006. ^ "Hamilton Mountain". Geographic Names Information System. United States Geological Survey. ^ "Hamilton Mountain Loop in Beacon Rock State Park". Hikespeak. Retrieved December 18, 2018. 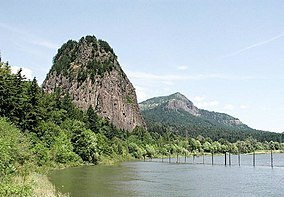 Wikimedia Commons has media related to Beacon Rock. This page was last edited on 18 January 2019, at 23:19 (UTC).